Are you looking for an elegant floor that brings a timeless, classic look to your home? Then you are looking for hardwood flooring in Bradenton, FL. There is a reason why hardwood floors have been one of the most preferred flooring options for homeowners for as long as there have been homes. 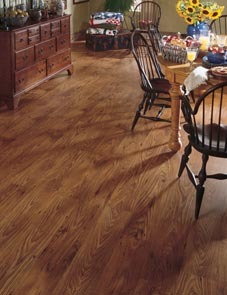 It is because solid hardwood simply cannot be beat when it comes to elegance and longevity. Whether you are re-flooring one room in your home or remodeling an entire office space, our team is here to provide you with comprehensive hardwood floor installation services using our wide selection of available products. It is always our goal to make sure we have a thorough understanding of our client’s needs in appearance, performance, and even price. Make a change that you will love for years to come by investing in new hardwood flooring. To get the results you are after for your home, you not only want to make sure you work with the hardwood floor installation experts at our company, but that you are also buying the trusted brands we sell at our flooring store. The quality of these name-brand options are second-to-none and they are all available at our store at a fair price. The brands we carry in our showroom include styles that are hand-scraped, engineered, and solid hardwood. No matter what your budget may look like, or what your species preference might be, we have the perfect style to fit your needs. Some of the popular brands that we stock in our showroom include Floorcraft, Downs Performance Wood, Spotlight Values, and others that you are sure to love. Proper hardwood floor installation is necessary to ensure that your new flooring looks and acts like it is supposed to do. An amateur floor installation can end up drastically reducing the lifespan of your new floor and lead to countless repairs in the future. This can end up costing you a lot more money in the long run than if you simply worked with a professional from the very beginning. The skilled, professional installers at our flooring store are qualified to perform the removal and installation of all types of new flooring. After you hire our installers to lay down your new flooring, our team will remove all of your old flooring and properly dispose of it before installing your brand new floor. We know how to get rid of all the old garbage under your existing floor to make sure your subflooring is perfectly even for the new installation. You can count on us to perform everything it takes to completely prepare your space for your new hardwood flooring. Your space will be fully transformed with brand-new floors in a shorter time than you imagined when you work with our specialized installation team. Make a purchase from us to take advantage of the Ultimate Confidence Guarantee available from our flooring store. Customers that make a purchase from our showroom are covered by a warranty that includes their purchase price. If you find a lower price on the exact flooring style you just purchased, you get a refund for the difference. Following through with our professional hardwood flooring installation also gets you coverage for the install. We will replace your flooring if you are not happy with it within a certain period of time after the service. Finally, for the lifetime of the flooring any installation-related repairs are paid for by us. Contact us today to for an appointment for a free estimate concerning hardwood floors. We are proud to serve clients in Bradenton, Sarasota, North Sarasota, and Palmetto, Florida, and the surrounding communities.